Pop does the shopping online. Consequently there are sometimes mishaps. Like last week when he accidentally ordered 1kg of root ginger! Not to worry. 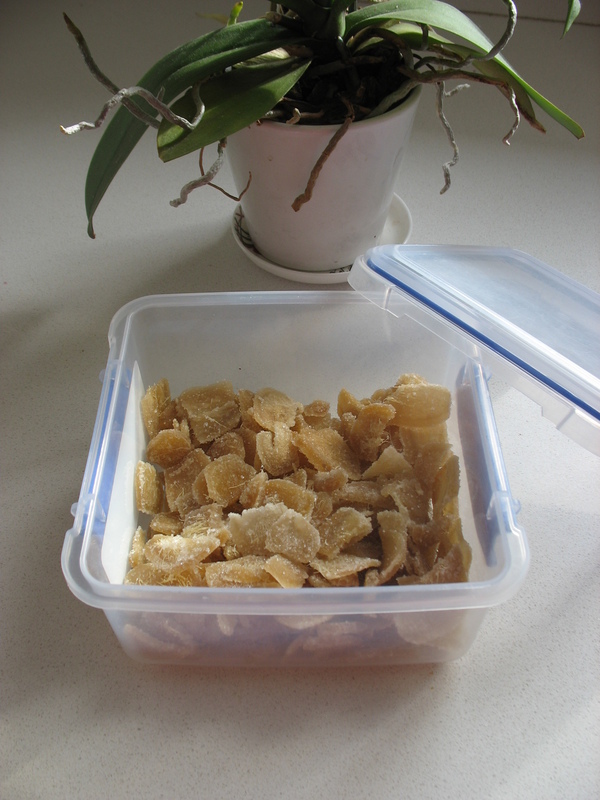 It was a great excuse to make crystallised/candied ginger. Which is delish and will be coated in chocolate at some point too. 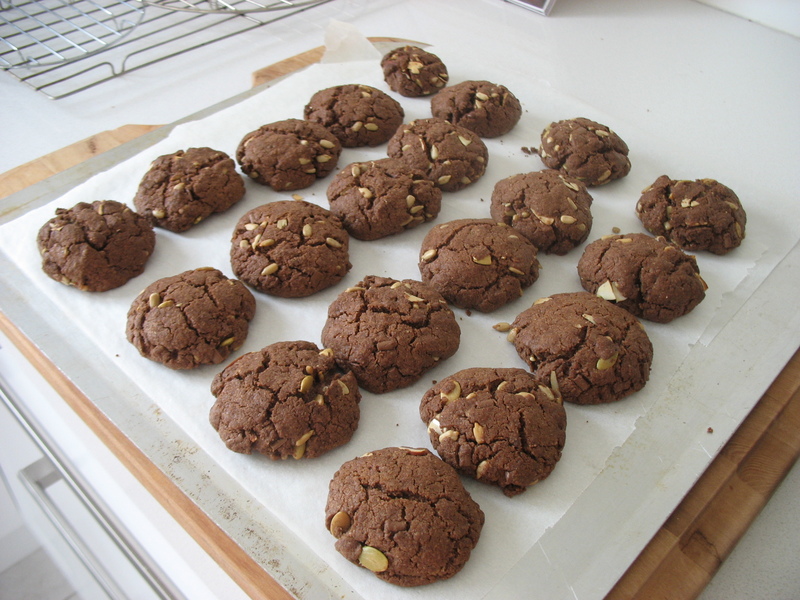 I also made a batch of my own biscuit/cookie recipe – Wholemeal chocolate chip and pumpkin seed. It’s been ages since I made them, and boy are they good. Sometimes I use sunflower seeds too, but unfortunately when these were ordered from the supermarket 500g of VitaPet Sunflower Seeds in Husks turned up! Oops! It will keep the birds in the back garden happy though. As we’re getting near to Advent, I thought I’d have a little giveaway. I was given this pattern by a friend as she accidentally got two. It’s just not me. I know it won’t suit my shape so I thought I would have a little giveaway. I’m happy to post internationally so if you want to win this pattern, leave your email address and a comment below with a story of one of your own shopping mishaps. I’ll draw the winner next week so the pattern can arrive before Christmas. Posted in Food, Gifts, Things to do with leftovers, Thrifty Miss and tagged biscuits, candied ginger, colette pattern eclair, cookies, cooking, crystallised ginger, dress, gifts, ginger, giveaway, pumpkin seeds, scraps, sunflower seeds, wholemeal. Bookmark the permalink. This is a phrase my husband uses to describe me when I am over excited – like today. If you do not already know about the Five Languages of Love then I suggest finding out about them. It will totally revolutionise your relationships. For those that do, my language is ‘Gifts’ so today was very high on the Excitement Plus scale because my advent swap parcel arrived! Look at all that lovely wrapping! 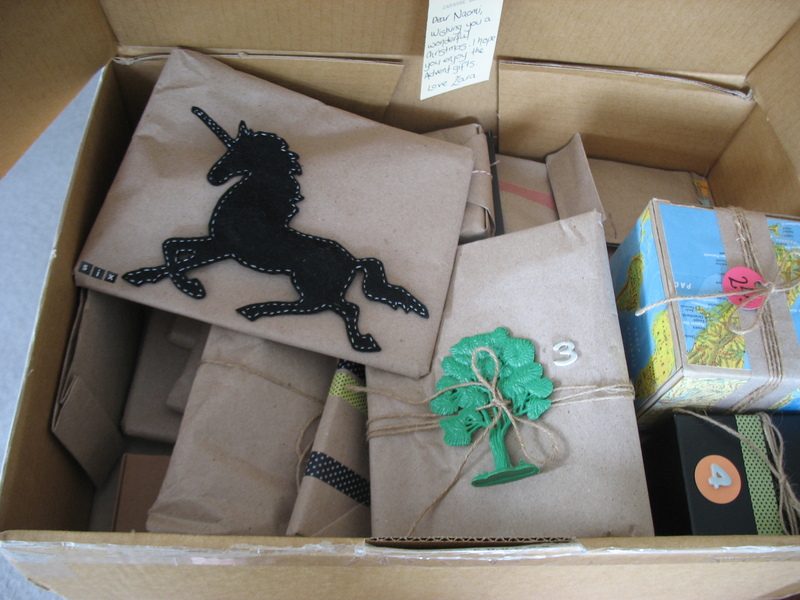 I can’t take my eyes off that unicorn and I really can’t wait for Saturday when the fun really begins. You can also see my latest book review here. Posted in Books, Gifts and tagged advent, ali smith, five languages of love, gifts, reading, the accidental. Bookmark the permalink. Today I’m sporting two looks. The first is what I wore to work, and is a summer trench coat I made with this beautiful vintage linen that I found in my sister’s stash. 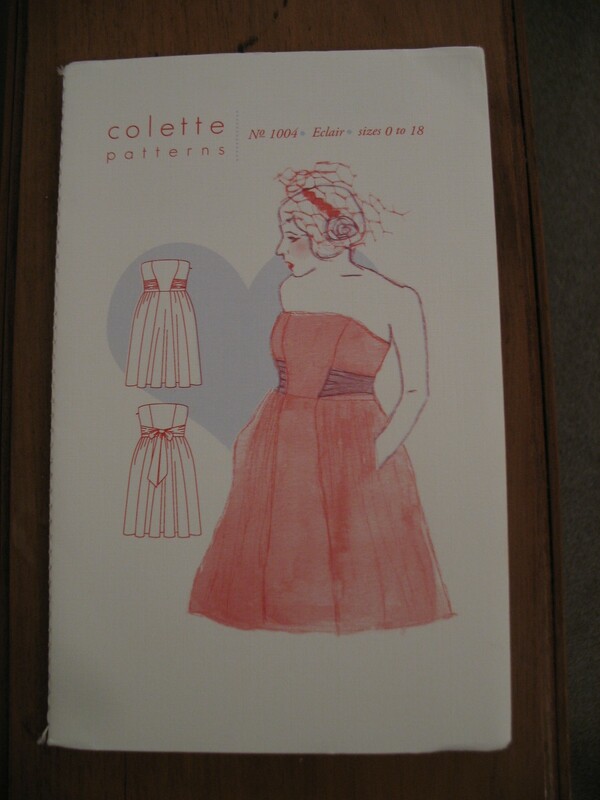 The pattern is Simplicity 2311. I wouldn’t recommend this pattern wholeheartedly because of the Project Runway element that gives you so many options of how to customise the pattern that it includes the fabric required for the sleeves separately on the back of the pattern. Some VERY clever cutting was required. There was also a lot of “Follow instructions 3-9 for view A” which means a lot of toing and froing with the instructions – not the simplest Simplicity I’ve ever used. However, I’m happy with the result and can see myself using the pattern again now that I’ve worked some of the bugs out. 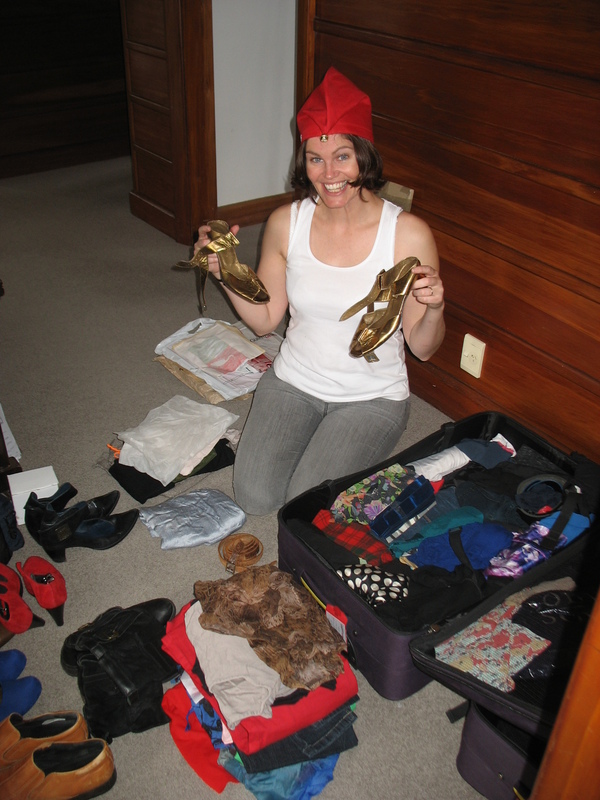 And the second look is me unpacking our suitcases that just arrived from Holland today. Yes, I’m wearing a gnome hat. I felt a festive accessory was needed! (And it’s a La Chouffe gnome hat – a very nice boutique Belgian beer – s0 it’s not without it’s creative merit.) It was so nice to see my clothes again, and a great relief to find everything was in one piece, except the shoes which were in two pieces as God and fashion intended. 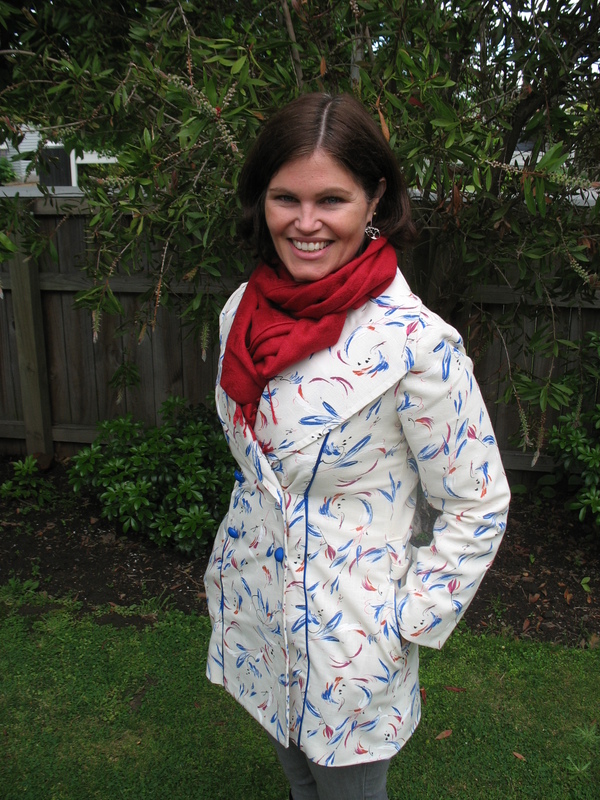 Outfit breakdown: Linen coat – handmade; jeans – Vila; pashmina scarf – Cambodia; pohutakawa earrings – Little River Gallery. Posted in Playing dress-ups, Sewing and tagged fabric, home made, jeans, sewing, simplicity 2311, wardrobe wednesday. Bookmark the permalink. This last line of this scene from an episode of the Simpsons is one I use a lot. I find it useful when describing those moments in life when you realise how fundamentally different from someone you can be. Marge: So… you want to go on tour with a traveling freak show. Homer: I don’t think I have a choice, Marge. Marge: Of course you have a choice. Homer: How do you figure? Marge: You don’t have to join a freak show just because the opportunity came along. Homer: You know, Marge, in some ways, you and I are very different people. I have these moments with my husband often, particularly when he wants to explain things like ‘how the moon works’ to me. 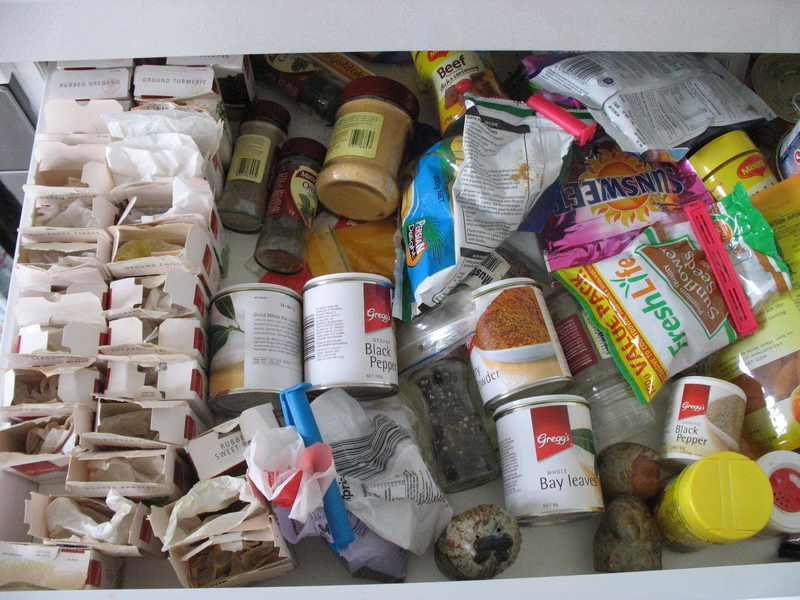 This time it was organising my Mother’s spice drawer that made me think of it. Here are the before and after shots. Satisfaction levels: high and rising from all parties! 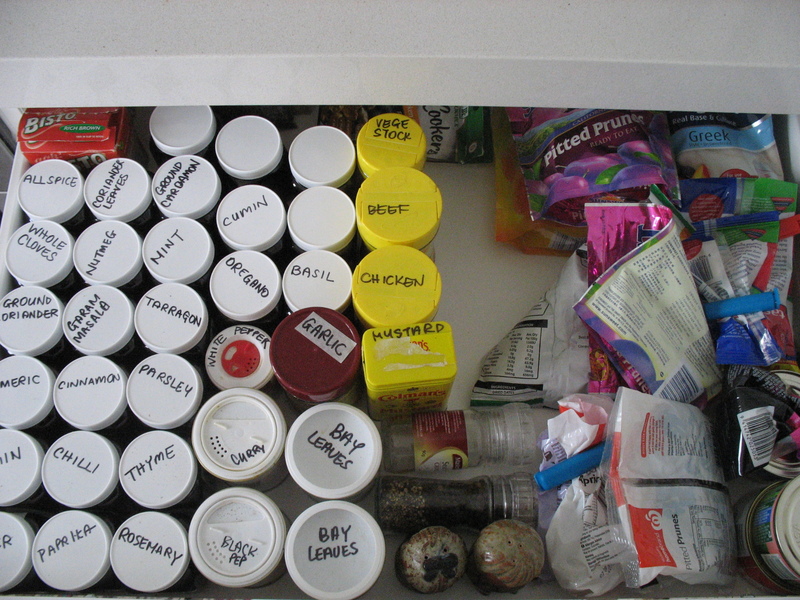 Posted in Food, Gifts, Organisation and tagged different people, homer simpson, organisation, organization, simpsons, spice, spice draw. Bookmark the permalink. I’ve been applying for lots of jobs and am finding that writing a CV for each is making me less inclined to want to spend time on the computer, so I’ve been a little lax on the blog front recently. So here’s a nice photo to take you into the weekend. 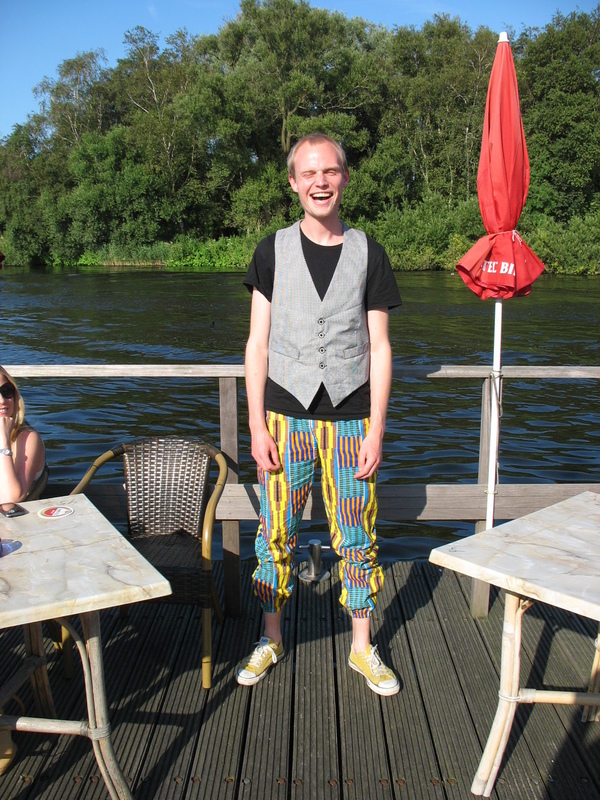 It’s of a friend, Jurriaan, wearing pants and a waistcoat I made. He chose the fabric of the pants and had input into the design because (in his own words and said with respect) he wants to dress “like a proud African man”. Posted in Gifts, Sewing and tagged african print, fabric, gay pride, gifts, home made, houndstooth, pants, sewing, waistcoat, yellow. Bookmark the permalink.